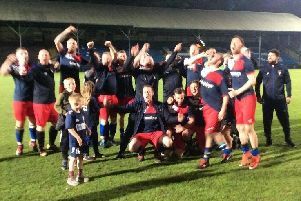 Last season’s beaten finalists Ryburn United Reserves went one better when they lifted the Halifax AFL’s Ziggy’s Metro Cars Invitation Cup at the Shay last night. A Nathan Hargreaves hat-trick gave them a 3-0 win over division-lower rivals Northowram Reserves. The game was won in a 15 minute spell midway through the first half when man of the match Hargreaves struck in quick succession. Ryburn were on the front foot from the off and Ash Shaw was only inches wide in the first minute after he latched on to a long ball over the top. Good work in the box by Jonny Mosey saw him turn his marker before laying off the Hargreaves who hammered home from 10 yards. Two minutes later good build up play from Shaw and Luke Kendall created a second for Hargreaves. Ryburn were well on top and more good play from Shaw played Hargreaves in again to make it three. Northowram were struggling to test the Ryburn defence but Chris Gent was a tireless worker as he tried to get his side back into the game. An early second half effort from Sammy Gee curled narrowly wide as Northowram pressed. But hard as they tried, Matt Calland and Ash Ackroyd got little joy up front. More Ryburn pressure led to Northowram ‘keeper Matt Jagger producing three stunning saves. The large crowd had been well entertained but the biggest cheer from the Rams section came with the introduction of the long serving Adie Hollands, playing his last game before retiring.